Paul and Ember CrivellaroEmber Crivellaro speaks affectionately about the city’s most highly regarded chefs as though they’re the neighborhood kids with a lemonade stand. Ember, and her husband, Paul, are some of the preemminent porcine professionals of Philadelphia. Country Time Farm’s customers include Le Virtu, South Philly Tap Room, American Sardine Bar, Southwark and the eateries of Jose Garces and Marc Vetri. Paul worked for years as a meat cutter at local chain grocery stores, and they started raising pigs on the side. “We got into it as a part-time venture.” Paul says. 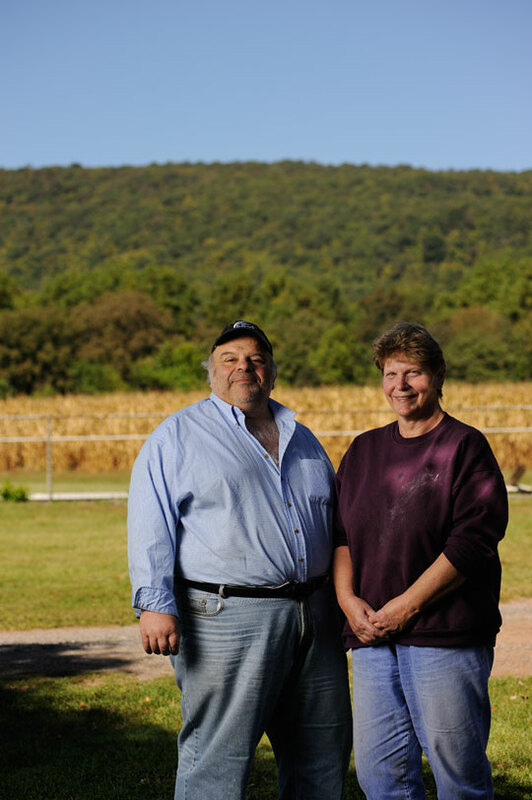 “My father always had a couple, and said if you want to make a little extra money, raise pigs.” When the couple moved to their Hamburg, Pennsylvania, farm in 1989, they carefully scaled up production. Even in their phases of growth, they’ve intentionally kept their operation modest so they can keep their work as hands-on as possible. 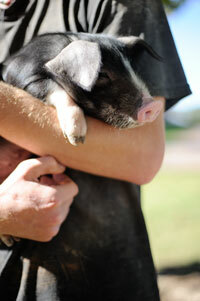 The Crivellaro’s breeding program includes about 30 sows, and they produce about 600 pigs each year, Paul says. The business itself is focused. “I see people raising chickens, eggs, meat birds, steers, gardening ... and 90 percent of them can’t do it properly, so we specialize on one thing and we try to do it correctly,” he says. Even so, they’ve had to be creative to stay viable in the industry. In the early 1990s, during the height of pork as “the other white meat,” they saw massive consolidation. 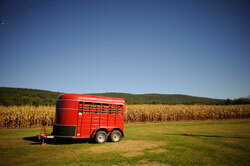 “The big boys wanted to get rid of small farmers,” Ember says. “We ended up selling pigs for 10 cents a pound, live weight.” At that price, the Crivellaros couldn’t even break even on what it would cost to get a pig to processing weight. “If Paul didn’t have a full-time job … we would have lost this farm,” she adds. This led Paul to reach out to Drew Keegan, who at the time was the director of PA Preferred, a public-private partnership between the Pennsylvania Department of Agriculture and companies in the state that helps to promote the state’s agricultural products. “He connected me with St. Joe’s food marketing students ... and a project to connect the farm to restaurants,” Paul says. Those students helped the couple brand their product. “We got two restaurants that way, and the rest was word-of-mouth,” Paul says. Soon, the Crivellaros found themselves at the forefront of farm-to-table distribution that would become a standard sourcing practice for many Philadelphia restaurants. On one hand, they started distribution in 2004 at the right moment, and they never had to look for customers. (“We didn’t have to! They called us!” Ember says.) But they’ve also had to pave the way: defending pricing that was higher than the industrial average, and politely declining requests for donations of their products and their skills. Despite the challenges, the pair has settled into a comfortable rhythm with their wholesale, restaurant and farmers market customers. When asked about what’s next for Country Time, Paul ensures that “as long as I can do it, we’ll do it.” Which is good news for Philadelphia chefs and diners who, having enjoyed a decade of Country Time pork on menus, might not know what to do without it. Story by Emily Teel. Photos by Albert Yee.